More on the opening of 5th Annual World's Finest Lace Show. M.F. 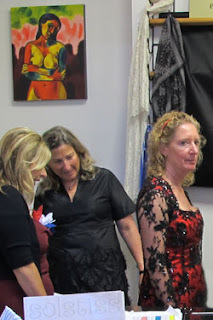 of Santa Barbara, California and Ms.
Cindy wowed everyone with her 30's inspired black beaded number, made using Solstiss' Black Beaded Lace, and lined with Red Silk Duchesse. Full pictures of this beauty will be posted to the clients' creation pages of FineFabrics.com later. L.G., of Letizia Alta Moda, Santa Barbara, California wowed and inspired everyone with her expert draping skills. 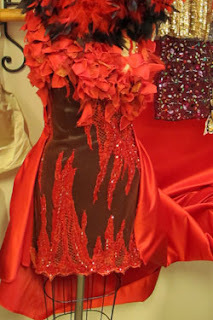 Wouldn't you love to show up for holiday festivities wearing a dress made using this embellished flame patterned lace, with red silk duchesse train. Stay tuned for more on the variety of interpretations available from Solstiss in this flame patterned lace, and others. Cindy's dress is gorgeous! She has such talent. I can't wait to see it in detail on your Client's Creations page.